This site is created and maintained by New Age Computer Systems as a community service. Recently added information now provides for elected official lookup with all details as well as on-line GIS maps of most of Manitowoc County, check it out on our links page! Ready for the swimming, surfing, and boating season: Beach Hotline, covers 102 Wisconsin beaches with daily quality reports. Lake Michigan water temps, wave conditions, and forecasts available at left under Marine Forecasts. Previous newsletters now indexed and available for download. Information here-in is seriously out of date, this website was/is due to the efforts of the Cleveland Area Chamber of Commerce and New Age Computer Systems. The Chamber has dis-banded and NACS has continued to host the site with our 'final' information as a public service. Most of the included clubs, groups, businesses, and municipal news are all now to be found at other sites. Want to know what's happening in the Cleveland area? Check out our Events Calendar page! Please let us know if your group or club has something special coming up! Cleveland Wisconsin is a village of about 1400 people on the shores of Lake Michigan. We are equidistant from the cities of Sheboygan and Manitowoc. The County Seat is Manitowoc, we belong to the Sheboygan Area School District and have a local elementary school. 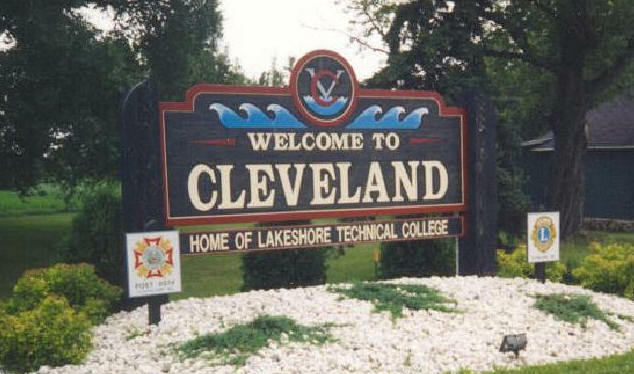 We are home to the Lakeshore Technical College and numerous service businesses. Our location next to Interstate Highway 43 and Lake Michigan surrounded by farms and beautiful outdoor areas makes our area a great place to visit or to live! Click here on Maps to find out how to get here, and how to get around the town once you arrive! Visiting or new resident? For information on Village services, ordinances, utilities, etc., check out our new Information for Village Residents page. If you would like to have an email address @clevelandwi.net, or would like to have a web page within our site for your business, church, or group, or to be an advertiser with us, please email us and we will send you the necessary information. We look forward to having you on board!! Cleveland, WI; "Where the land meets the lake". Copyright © 2006-2011 All rights reserved. Our standard download format is Adobe Acrobat PDF. If you need the free Adobe Acrobat Reader, click here. All phone numbers listed are area (920) unless otherwise listed. Page hits since last major update.